The voters of the United States elected two Detroit-area residents to the presidency. Ulysses S. Grant served as an officer at Fort Wayne around 1850, some years before he defeated the Confederate armies of General Lee, and then, was elected president in 1868. His home, now located at the State Fair Grounds, is a State of Michigan Historic Site. George H. W. Bush served briefly at the Grosse Ile Naval Air Station late in World War II when that site was major training for US and British pilots. This was about 43 years before his election to the presidency. Who will be the first Detroit resident to be officially declared a saint by the Roman Catholic Church? You might bet on Father Solanus Casey. Bernard Francis Casey was born near Oak Grove, Wisconsin in 1870 into a family of Irish immigrants that included 16 children. He dropped out of school and worked at a variety of blue-collar jobs in Wisconsin and Minnesota. Accounts of his life, suggest that he had a conversion experience while operating a street car in Superior, Wisconsin. Along his route, he saw an inebriated sailor cursing and stabbing a young woman who died from the attack.. This breech of charity led Bernard Casey to seek a different profession so, at age 21, he enrolled in a seminary run by the diocese of Milwaukee. Apparently, he did not do well in his academic work so he was asked to leave St. Francis de Sales seminary. Five years later, he decided to become a Franciscan friar, so he moved to St. Bonaventure Monastery in Detroit for his training. He continued his studies and was ordained a priest in 1904. He selected Solanus as his religious name. This honors a Franciscan missionary, Francis Solanus who was born in Cordova in 1549, became a Franciscan priest and then traveled to South American to minister the indigenous peoples. He had a reputation for being able to quickly learn many Indian languages and dialects. Solanus died in Lima in 1549 and was canonized as a saint in 1726 by Pope Benedict XIII. Father Solanus Casey’s first 20 years of service were in the New York City area but, in 1924, he returned to St. Bonaventure monastery on Mt. Elliott in Detroit. The Franciscans, a mendicant order, have a long-standing reputation for their devotion to the poor. During the Depression decade, St. Bonaventure Monastery was a major source of food and support for impoverished people on Detroit’s East Side. Father Casey organized the Capucian Soup Kitchen at St. Bonaventure monestary in 1929 and earned his reputation for exceptional charity by serving as the door keeper at St. Bonaventure from 1924 to 1944. Solanus Casey was not an accomplished student, so when he completed his studies he was defined as a “sacerdis simplex” priest. This is a priest whose powers are severely restricted. 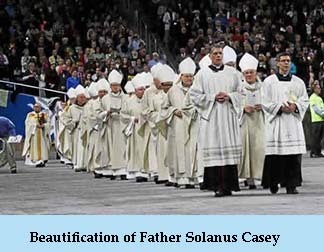 Casey could celebrate Mass but was prevented from hearing confessions or giving sermons. Perhaps, this explains why he devoted himself to the job of being the monastery’s doorkeeper. Apparently, he tirelessly greeted supplicants who came to the monastery’s door seeking food, shelter, and help with their illnesses or with their marriages or any other problems. He had a reputation for being available at all hours and listening compassionately to anyone who came. Many seriously sick people visited Father Casey and asked for his prayers. Quite quickly, he developed a favorable reputation since many of the sick individuals attributed their cures to Father Casey’s intervention with God through his prayers. That is, even while he was living, he was assumed to have the power to intercede with God for cures from diseases. Father Casey was aware of his role. He began keeping notebooks of the requests that he received and the resolution, if any, of the problems. Apparently, he recorded about 700 cures of cancer, leukemia, tuberculosis, arthritis, blindness and diphtheria that the faithful believed resulted from his prayers. And, this being Detroit, the automobile industry was also involved. The Detroit News published a story of a man working at a Chevy parts factory in Detroit in 1925 who feared immediate unemployment because production was sinking. He sought Father Casey’s assistance. Within two weeks, a huge order arrived, keeping the Chevy plant open and the supplicant working. In 1944, Father Solanus Casey was assigned back to New York but then retired the following year in rural Indiana. In retirement, Father Casey received as many as 200 letters a week from individuals who presumed that he could intercede with God for the favors or cures they needed. Apparently, he tried to respond to as many as he could. He was diagnosed with skin cancer in about 1946 and returned to Detroit where treatment was available. He died at age 87 in 1957. During his long lifetime, Father Casey developed a large following of the faithful who assumed that his prayers quickly reached an attentive God. Shortly after his death, discussion began of his possible canonization as a saint of the Roman Catholic Church. Becoming a saint ordinarily requires a successful and persistent promotional campaign since bureaucrats at the Vatican must be convinced of the worthiness of the candidate. There should be evidence of the moral rectitude of the candidate and, for Father Casey, this was easy to demonstrate. However, proof that a candidate is in heaven is enhanced if prayers asking him to intercede with God for exceptional cures or favors are demonstrably successful. This is approximately the current point in the path toward his possible canonization. Vatican officials, in 1995, declared that Father Casey was venerable. This was the first major step on the road to canonization, somewhat similar to playing for the Toledo Mud Hens prior to playing for the Tigers. There are now perhaps as many as a dozen websites devoted to Father Solanus Casey, all of them promoting his canonization. The second step on the road to sainthood is being declarted Blessed by the Holy Father. At least one miracle is required for this. Advocates for a candidate for sainthood must present evidence that prayers to the potnetial saint produced a miracle. The documents go to the office of the postulator in the Vatican who makes a call about the validity of the claim. On May 4, 2017, Pope Francis approved the beatification of Solanus Casey. That reflects the judgement of the Vatican bureaucracy that Solanus Casey is in heaven and that prayers to him led him to intercede for a miracle. I believe the miracle involved a woman from Panama who had an extreme case of skin cancer. She came to Detroit seeking treatment and was encouraged to pray regularly and often at the tomb of Solanus Casey. She was cured of her ailment. On Saturday November 18, 2017, the official beatification ceremony took place in Ford Field with a crowd of 60,000 present. The third and final step on the road to sainthood involves the demonstration of a second miracle. Presumably, Father Solanus Casey's advocated will present additional evidence to the Vatican's postulator. If the bureaucrats there are convinced, we might expect that Solanus Casey will be canonized as Detroit's first Saint. There are currently 12 individuals who lived in the United States or did charitable work in the colonies that are now this country who have been cannonized as Saints. 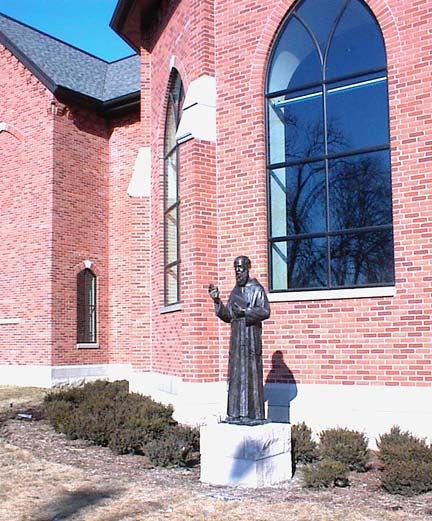 The statue of Father Casey is on the grounds of St. Bonaventure Monastery—a complex of buildings listed on the federal and State of Michigan and the City of Detroit historical registers.